Don’t Try This At Home: From Dogma to Dogville is the story of the Mini DV revolution that occurred in independent filmmaking in the late 1990’s. Directed by Matthias Maass, this documentary focuses on three of the most important cameramen of the period: Anthony Dod Mantle, Benedict Neuenfels and Robby Müller. These men can rightfully be credited as the fore-runners today’s independent and art-house cinema. Müller is reknowned for his breathtaking art work in the movies of Jim Jarmusch and Wim Wenders, as well as for the scandal he created with his work on Breaking the Waves. He shot his debut feature film, My Brother Tom, with an amateur camera, a technique which was repeated in his subsequent films, including Michael Winterbottom’s 24 Hour Party People. Anthony Dod Mantle worked in a variety of films across a vast range of artistic approaches, from his break in the industry with The Feast to his later work on films like 28 Days Later and Dogville. His camera image design for Slumdog Millionaire fetched him the Academy Award in 2009. The German cinematographer Benedict Neuenfels belongs to the younger generation of cameramen in German. As someone who is always in search of new artistic methods and approaches he has been responsible for controversies with The Rock, as well as competing for the Golden Bear at the 2002 Berlin Film Festival, before winning Best Foreign Film at the 2008 Academy Awards for his film The Counterfeiters. I loved Robby Müller’s work and I asked Wim Wenders in 1980 how I might meet him. I was going to the Rotterdam Film Festival to show my first film, Permanent Vacation, and at that time in Rotterdam the people who visited the festival stayed on a boat that was harboured there, it had a bar in it, and Wim said, ‘Just go on the boat and in the bar next to the peanut machine, Robby Müller will be sitting there.’ So I went to Rotterdam, I went on the boat, I went in the bar, and next to the peanut machine Robby Müller was sitting there. (Laughter) Seriously. So I sat down next to him and started talking to him. And we hung out quite a bit at the festival and he saw my first film, and he said to me eventually, ‘If you ever want to work together man, let me know.’ That was a big thing for me. 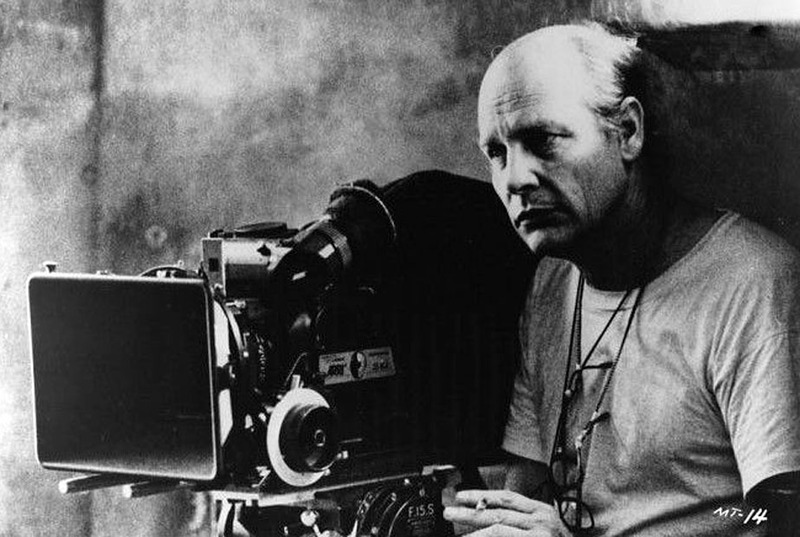 I made my next film Stranger Than Paradise with my friend Tom DiCillo, because Tom was working then as a director of photography, but he really wasn’t interested in shooting films, so when I wrote Down By Law, I immediately called Robby Müller. 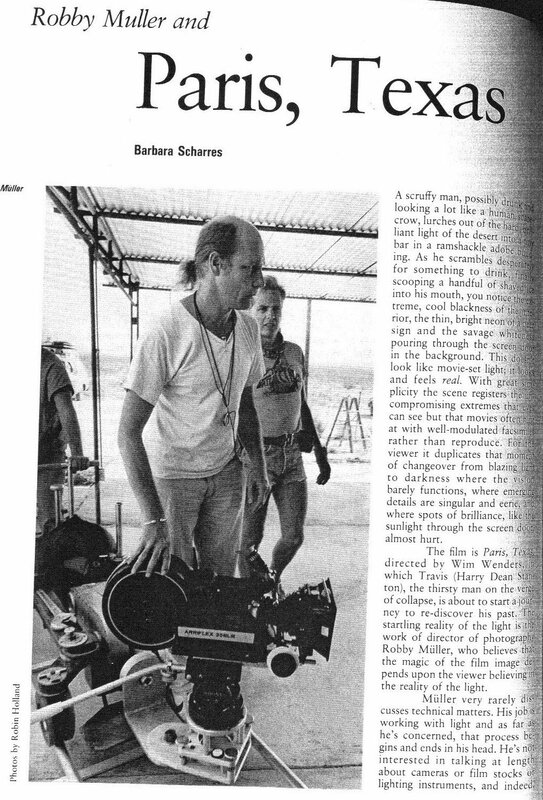 Robby Müller shooting Paris, Texas.